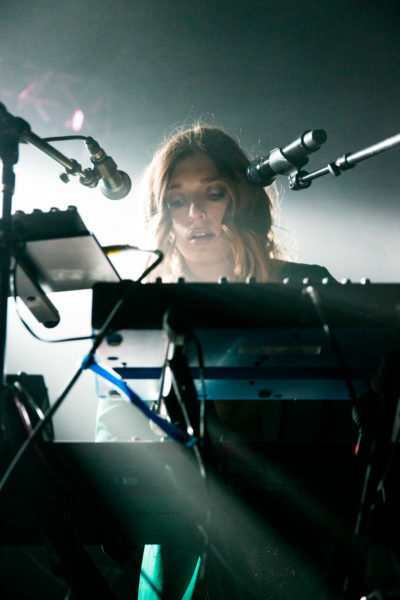 On her stop in Boston, VÉRITÉ owned the stage. Despite being the opener for EDEN’s Vertigo Tour, VÉRITÉ performed like she was the one everyone came for. 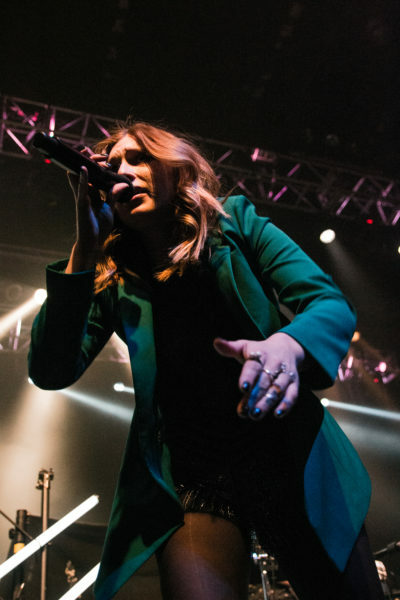 Her presence on stage was felt throughout a packed House of Blues. Even with the show falling on a Monday night, a wide range of age groups filled the venue. During VÉRITÉ’s set, it was evident that she appealed to all ages and was able to deliver an incredible show. When first stepping into the music hall, my eyes darted straight to the bright neon white sign which read “VÉRITÉ”. Not only was this a nice touch to the set design but it was also a simple way to enhance name recognition. Used as a PR tactic, this investment is a fun way of making sure the audience remember the artist name. As the clock struck 8 it was time for VÉRITÉ’s set. The lights dimmed and her drummer and guitarist took the stage. With the screaming of the crowd, VÉRITÉ confidently walked on stage. In her outfit for the night, one thing I found very suiting was her dark green blazer which depicted the cold and dark spring night perfectly. Also, her choice of reflective silver beaded shorts created an extra few beams of light when met with the stage lights. She Started her single “When You’re Gone” and elected to replace the drum-heavy intro with her own piano playing. Following the intro, she resumed with the high energy of the song, moving all around the stage with drums and guitars in full effect. She continues with songs including “Rest”, “Undressed” and crowd favorite “Somebody Else”. Each of the songs gave her time to show off her vocal talents as well as her skill on the piano. A big part of VÉRITÉ’s performance was her energetic and confident stage movement. When not jamming on the piano, she would be flowing from end to end of the stage, feeling the music and energizing the crowd. Even when looking at her drummer and guitarist, one could see the level of enjoyment and spirit they had in their every beat or stroke. Every hit on the drums was not only felt throughout the whole venue but seen as the stage lights flashed along. Because of the clear amount of passion and liveliness by everyone in VÉRITÉ’s crew, the choice of stage lights, serene vocals, and acoustics, the House of Blues experienced an amazing set that I was glad to be able to witness.